1 Chicken 4 to 5 pounds, washed, lumps of fat removed, and blotted dry. Sprinkle 2 tablespoons rub in the cavity of the chicken. Sprinkle 4 tablespoons rub on the outside. Drink half the beer and make a few additional holes in the top of the can. Add remaining rub into the can. Hold the bird upright and insert the can into the cavity. 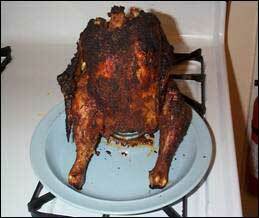 Place the bird upright in a roasting pan, spreading the legs so the chicken stands upright on the legs and tail. Roast until brown and crispy skin and tender, 2-2½ hours. Present the bird upright, still on the beer can, on a platter with the legs still spread. Be careful because the meat will fall off the bone. For a barbecued flavor, baste with a mixture of 3 Tbs melted butter mixed with 1½ tsp liquid smoke (optional).